For our new lineup of Salad Bar Dinner Deals, we're showcasing the best of the best from our all-time guest favorites! Available from 4-9PM, you can enjoy any of the following delicious dinners, plus our Soup, Salad & Fruit Bar for only 10.99! Our Nantucket Cod features oven-baked cod that is stuffed with our homemade blend of crabmeat, shrimp, spinach, onions, cheddar cheese, and cracker crumbs. It’s served with your choice of one side, bakery-fresh rolls, and our Soup, Salad & Fruit Bar! We’re making dinner bigger and better than ever with our new Premium Salad Bar Dinner Deals. 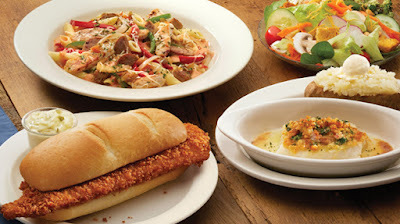 Enjoy any one of the following dishes, paired with our Soup, Salad & Fruit Bar, for only 12.99! Our Whale of a Cod fillet, hand-breaded with panko breadcrumbs and fried to perfection. It’s served with tartar sauce, our Soup, Salad & Fruit Bar, your choice of one side, and bakery-fresh rolls! Perfect for the shrimp lovers everywhere! Enjoy six butterflied shrimp with a crispy coating of panko breadcrumbs and OLD BAY Seasoning. We serve it with cocktail sauce for dipping, our Soup, Salad & Fruit Bar, your choice of one side, and bakery-fresh rolls! The deals are OK, but why not have a pasta dish with meat other than sausage? Would be more variety. Thanks for your comment! We will make sure to pass along your suggestion for a wider variety of meats with our pasta dishes to our menu development team!